Our life is a manifestation, and we can very well make that manifestation beautiful and meaningful and have a good influence. As a collage artist, sometimes I just start cutting out images from my stash of magazines that represent different parts of myself or the kinds of energy I want to attract into my life. Maybe after spending a day at my job on the computer, I’ve simply got to get into the right side of my brain. And, one way to get there is simple–find inspiring images, cut them out, and put them on a bulletin board. I mean you don’t have to be Picasso to cut paper. Somehow, looking at a zebra in Africa or a vase of cut flowers makes me optimistic. Or, turning a page and seeing a confident woman standing in a beautiful art studio surrounded by the tools of her craft, lifts me from the mundane into the imagination where all possibilities exist. I’m moved by what I see. That’s why I love making art and seeing other people’s art. I like all kinds of art and think people who are creative are some of the most fascinating people in the world, even when they’re crazy. I like the way text looks on paper and the way colors pop from pages, and the way seeing a picture of sky gives me hope that life will be better. 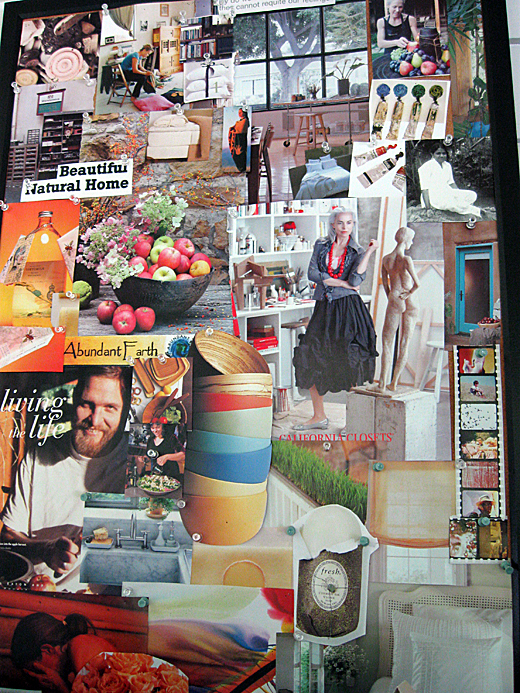 Making my vision board tells my brain there is this world of possibilities out there I can tap into. It’s like unplugging from the matrix of daily life and being five years old. I can, for a while, forget about time and that I have to get up in the morning to BE somewhere. I can stop thinking about global warming and Hurricane Sandy and worrying about the election, because I’m busy with my own business–I’m cutting out pictures and pinning them on a cork board. I’ve done that – hummm maybe I’ll do another one 🙂 I belong to a crafts group. We get together and cut out paper and pate, make boxes whatever, It’s just good to get together with a few friends and make something. Later something comes out in your art work.